When a school, sports team, or brand is big, its merchandise becomes a target for people to reproduce in a similar, cheaper way. Yes, I am talking about counterfeiting. It has come to the attention of KGW.com and FishDuck.com that there is a decent amount of counterfeit Ducks apparel being sold on the internet. Especially Marcus Mariota jerseys! Kylie Iboshi reported that if you go to Google and type in “Cheap Mariota Jersey,” numerous replicas of Mariota’s Oregon Ducks jersey will pop up. For a real, Nike/Oregon-produced No. 8 jersey, the price is $89.95, but the counterfeit replicas are selling for $26.89. That’s a big price difference! “Pretty much anything that we make and license, you could probably find somebody who could counterfeit it,” said Matt Dyste, UO Director of Marketing and Brand Management. Dyste and the University of Oregon do the best that they can to protect the brand but with all of the different jerseys the program produces, it’s getting harder and harder to protect it. .
Dyste explained that they are a bigger target now after this past season. When a large amount of counterfeit gear is being sold, it potentially costs the university and its suppliers tens of thousands of dollars in lost revenue. Not only is the university on the losing end of things due to counterfeit gear, the fan buying the gear is on the losing end too! When fans see that $26.89 price they most likely think they’re getting a sweet deal, not a cheap reproduction from a side producer. The majority of counterfeit gear is sold online. When the university finds a website that is selling counterfeit products, they send out a legal warning (it’s called a Take-Down notice) for the site to stop their business. Oregon sends anywhere from six to 15 Take-Down notice warnings a month. As fans, it’s hard to tell what’s real and what’s not sometimes. Especially through the internet. However, it is important to be aware of the problem in occurrence and keep your eye out for it. No one wants knock-off gear — get the real thing! It’ll be of higher quality and benefit the school and program that you are supporting. 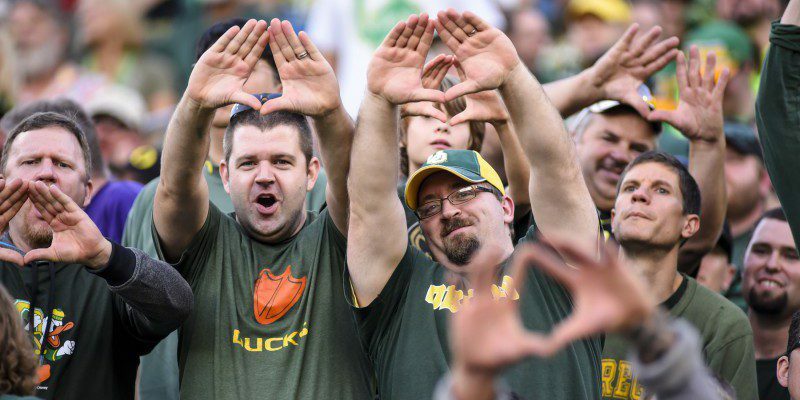 Visit the linked website to take a “Real or Fake” quiz based on pictures of Oregon gear so you can see what fake merchandise really looks like!